3.Preheat a large skillet over medium-high heat. Spray with cooking spray. Pour batter into the hot skillet, about 1/4 cup of batter for each pancake. 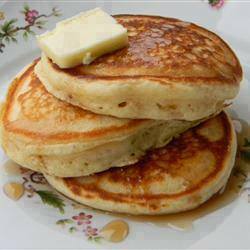 Cook for 2 to 3 minutes, until bubbles appear on the sides and center of each pancake. Flip and cook until golden, about 1 to 2 minutes.